Former MLB slugger Darin Ruf has decided to return to the Korea Baseball Organization’s Samsung Lions, per a club announcement. Dan Kurtz of MyKBO.net passed along the news, which arrived via Naver Sports (Korean language link). Ruf, who’s now 32 years of age, will receive $1.4MM in guaranteed money and can also pick up $300K in potential incentives. Evidently, he was unable to find more appealing opportunities with a MLB outfit. That’s hardly surprising given then tough market facing most lumbering power hitters of Ruf’s ilk. It’s a nice consolation prize for the five-year MLB veteran, who has thrived in the hitter-friendly KBO since heading there in advance of the 2017 season. Last year, he delivered a healthy .330/.424/.605 slash with 33 long balls. He placed third in the league in OPS, lagging only Park Byung-ho and Kim Jae-hwan. It’s always interesting to peruse the KBO leaderboards to see the eye-popping numbers some familiar names are posting in Korea’s top league. Former major leaguer Kazuo Matsui has rejoined his first professional team, the Seibu Lions of Nippon Professional Baseball (hat tip to Kyodo News). The 42-year-old was not offered a contract by his previous team, the Rakuten Eagles, and will now reportedly take on both outfielder and coaching duties for the Lions. “I felt strongly about continuing my playing career,” Matsui said. “I know the competition will be tough but I’ll get more motivated playing against younger players.” Matsui hit .267/.321/.380 while stealing 102 bases across 2,555 major league plate appearances with the Mets, Rockies and Astros from 2004-2010, with whom he played mostly second base. During his Japan career, however, Matsui put up fantastic offensive numbers (including 201 career homers). He earned four Gold Glove Awards as well as the 1998 Pacific League MVP Award. Former Phillies outfielder/first baseman Darin Ruf has found some success in Korea, hitting 31 homers and leading the entire Korean Baseball Organization with 124 RBI. According to the Yonhap News Agency, the Samsung Lions recently re-signed him for the 2018 season on a $1.5MM deal. During his career in the U.S., Ruf played at the MLB level during parts of five seasons, bouncing back and forth between the Phillies and their Triple-A affiliate. Across 833 major league plate appearances, he played at roughly replacement level, showing poor plate discipline (8.2 BB%, 27.5 K%) but decent power (.193 ISO). Elsewhere in the KBO, the NC Dinos have inked former major league pitcher Logan Verrett to a pact worth $800K (also via the Yonhap News Agency). Verrett had a 4.62 ERA during his major league career with the Mets and Orioles. A whopping 15.5% HR/FB rate may have done him across his 150 career MLB innings, along with a very low 6.84 K/9. According to a tweet from ESPN’s Jerry Crasnick, multiple MLB teams have shown interest in former Padres pitcher Jay Jackson. Crasnick notes that Jackson has been one of the best setup men in Japan over the last two seasons. Jackson only pitched 4 1/3 innings at the major league level in 2015, but did flash a 95.1 MPH fastball. He also put up a 2.54 ERA in 63 2/3 innings with the Padres’ Triple-A affiliate that same season. SATURDAY: The Dodgers have officially announced that they’ve released Ruf, clearing the way for him to head to Korea. FRIDAY 9:12am: The Lions have already announced the move, as Jee-ho Yoo of Korea’s Yonhap News Agency reports. Ruf will earn $1.1MM in 2017 — a significant step up from what he’d have earned in the Majors or minors. Ruf saw just 89 plate appearances in the Majors last season, hitting .205/.236/.337 in that time. The first baseman/outfielder spent the better part of five seasons on the fringes of the Phillies’ roster, often serving as a right-handed complement to Ryan Howard. In 833 Major League plate appearances, he’s a .240/.314/.433 hitter with 35 home runs. The move to Korea likely works out well for all parties, as the Dodgers will free a roster spot (and receive a fairly nominal sum from the Lions), while the Lions add a new bat to their lineup. Ruf, meanwhile, should earn considerably more than he’d have earned in the United States playing over in Korea. He was a long shot to make the Dodgers’ roster, and even if he had, he’d have made only a bit more than the Major League minimum as a pre-arbitration player. Foreign players in Korea can often earn salaries in the upper six figures, if not seven figures, and it stands to reason that Ruf will benefit financially from the move. The Diamondbacks expect to enter 2017 with approximately the same payroll level that they carried last year, GM Mike Hazen tells Nick Piecoro of the Arizona Republic (Twitter link). With about $60MM in obligations and another $30MM or so in projected arbitration salaries, it wouldn’t appear that Arizona will have a lot of free cash to work with this winter after opening 2016 with just under $100MM on the books. While it’s always possible that trades could shift things around, indications from the front office are that players such as Zack Greinke, Paul Goldschmidt, and Yasmany Tomas aren’t likely to be moved. All said, then, the odds appear to favor a fairly quiet approach to the free agent market from the D-Backs. The Giants feel confident they will land one of the three major closers available in free agency this winter, a club official told Jeff Passan of Yahoo Sports (Twitter link). We’ve already heard the team linked to Aroldis Chapman, Kenley Jansen, and Mark Melancon (who they met with today), though as John Shea of the San Francisco Chronicle writes, the organization is considering alternatives as well. GM Bobby Evans called rehabbing righty Greg Holland a “very good option,” and there are always trade routes to consider. But the expectation has long been that San Francisco would go shopping on the open market to address the ninth inning, and the club seems a strong favorite to land one of those premium arms. Dodgers GM Farhan Zaidi addressed his club’s decision today to ship Howie Kendrick to the Phillies, as Bill Shaikin of the Los Angeles Times reports. “Financial flexibility” was a motivating factor, he said, and the organization also liked the idea of adding Darin Ruf — who Zaidi said was pursued over the summer. Addressing second base, which Kendrick could conceivably have played, Zaidi noted that the Dodgers could go with players already on hand — Enrique Hernandez, Micah Johnson, and Chris Taylor — but added that there’s ample time “to bring in a more experienced player.” Free agent Chase Utley still seems an option, though Zaidi did not discuss him specifically, and there are certainly a variety of interesting trade candidates that might be considered. Kendrick had occupied left field in 2016 for Los Angeles, and his departure leaves an opening there, but Zaidi said that’s “not a position we are targeting right now.” He expressed confidence in existing players such as Andre Ethier, Andrew Toles, Trayce Thompson and Scott Van Slyke in the corner outfield. Of course, right field is also up for grabs, though the team could yet rely on Yasiel Puig along with those other options. The idea of the Rockies bringing back Matt Holliday may not be an unreasonable one, Patrick Saunders of the Denver Post writes. The veteran slugger has expressed interest in the concept, and Saunders notes that Holliday could see time both at first and in the outfield — which currently features three left-handed hitters. The Padres will look to make a few targeted veteran additions this winter, Dennis Lin of the San Diego Union-Tribune recently explored. GM A.J. Preller spoke of finding one or two “guys who have good makeup, guys who are in it for the team, guys who are willing to work, guys who aren’t selfish.” That could be outfielder Jon Jay, who the team is still interested in. Preller spoke highly of the versatile outfielder, but noted that preserving opportunities for a variety of younger players ill be a consideration “as we’re talking to Jon and determining an offer, the term and length.” Shortstop is perhaps a greater priority, with Preller noting that it’s “still an area we’re looking to address.” The team still isn’t sure whether Luis Sardinas is prepared to be an everyday player, Preller suggested. Jose Rondon will also receive consideration, but the organization certainly seems open to pursuing alternatives via trade or free agency. 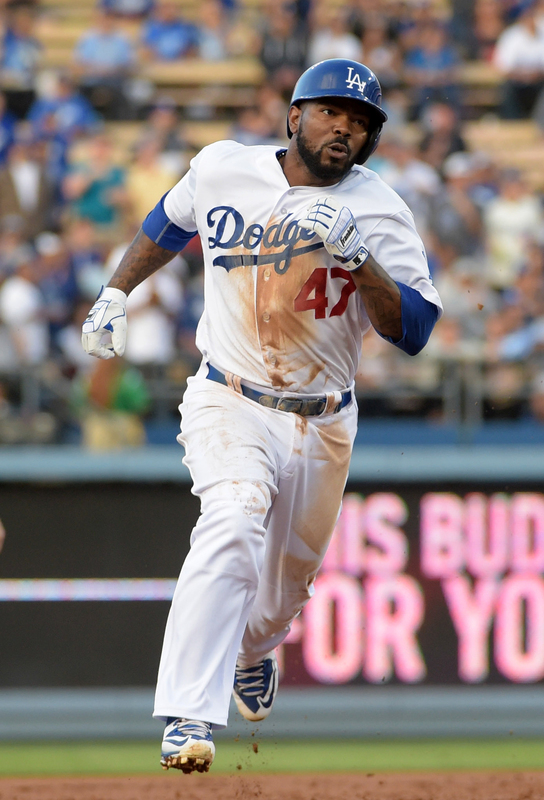 The Phillies have acquired infielder/outfielder Howie Kendrick from the Dodgers, per a club announcement. First baseman Darin Ruf and second baseman/outfielder Darnell Sweeney will head to Los Angeles in return. Still, adding the veteran would seem to make it somewhat more likely that the Phils would feel comfortable parting with Cesar Hernandez, the incumbent at second. Hernandez, 26, added on-base ability to his speed and defense in 2016 for a surprisingly excellent campaign. With three years of control remaining, he is a rather appealing potential trade piece — not least of which since he has also spent time at short and center. Jim Salisbury of CSNPhilly.com reports that Hernandez drew strong interest at the GM Meetings, and while Kendrick may not currently be slated to step right in to replace him, it remains plausible that the Phillies could look to cash him in at some point over the coming months. Regardless of precisely how he fits, Kendrick will provide the Phillies with just the kind of veteran presence they entered the offseason in search of. And he’ll do so without requiring a multi-year commitment. If all goes well, he’ll bounce back after an uncharacteristically poor season at the plate. Kendrick ended with a .255/.326/.366 batting line, with eight home runs and ten steals, over 543 plate appearances. That was easily the worst full-season effort of his career. If Kendrick can regain his form, he’ll help the team improve its level of play and may even turn into a trade or (perhaps less likely) qualifying offer candidate. There is some reason for hope. He maintained a strong 33.8% hard-hit rate even as his typically high BABIP dipped to .301 — easily a career-low. And Kendrick managed to boost his walk rate to a career-best 9.2% while maintaining his characteristically palatable strikeout numbers (his 17.7% K rate last year landed just north of his 17.2% career rate). For the Dodgers, the swap was more about clearing payroll and roster space — particularly after Kendrick expressed disappointment with his usage. Now, the team’s needs in the corner outfield, and at second and third base, are all the more pronounced. Already a lefty-leaning club with the bats, Los Angeles seems primed to pursue right-handed hitting in more than one area this winter. But while the return wasn’t the driving force here, there’s reason to believe it could deliver some function, especially for the always-clever Los Angeles front office. Ruf, 30, is perhaps likeliest to make an impact. He had a short and forgettable MLB stint last year, but raked at Triple-A and owns a .299/.379/.542 lifetime slash against left-handed pitching. True, the right-handed hitter has been sub-par without the platoon advantage, and contributes nothing on the bases or in the field (though he can play some first and, at least in limited doses, the corner outfield). He’s also out of options. But the Dodgers have a number of flexible assets and may like the idea of allowing Ruf to spell Adrian Gonzalez at first base and function as a right-handed bench bat — or, at least, giving him the chance to unseat Scott Van Slyke in such a role in camp. Sweeney, too, has some potential uses. The 25-year-old switch-hitter, who originally came to Philadelphia from Los Angeles in the Chase Utley deal, is capable of playing all over. He didn’t hit much in a brief MLB debut in 2016, and struggled last year at Triple-A. But he has shown better at times in the past, even flashing double-digit home run power and real stolen base potential in several separate seasons, and it wouldn’t be all that surprising if he found his way onto the Dodgers’ roster at some point. Doing so would mean adding him back to the 40-man, as he had been outrighted by the Phils, but that too increases his appeal at this stage since he won’t occupy a roster spot upon his arrival. If the Marlins make a “big splash free agent push,” MLB.com’s Joe Frisaro believes it could be for a top closer like Aroldis Chapman or Kenley Jansen rather than a starting pitcher. While the Fish are in major need of rotation help, the lack of appealing free agent starters this year could lead the team to spend what dollars they may have on a reliable stopper. Miami could sign a free agent starter at the right price, and Frisaro believes the club could both make a signing as well as acquire another arm by trading a position player. Trades also could be necessary for the Marlins due to payroll concerns, Frisaro writes elsewhere in his mailbag piece. He thinks Miami’s payroll will rise to around the $90MM range next year, though the Marlins already have roughly $76.3MM earmarked for just 12 players due to salary commitments and arbitration projections. Dexter Fowler could be a fit for the Mets if Yoenis Cespedes leaves in free agency, Joel Sherman of the New York Post writes. The Mets could add Fowler and re-sign Neil Walker for the money it would take to land Cespedes, and having those two switch-hitters would give the Mets greater depth and versatility. Fowler also brings defensive value as a center fielder, which would help New York since neither Curtis Granderson or Michael Conforto are good fits for the position. Signing Fowler would be an alternative to the Mets’ plan to wait out the Cespedes market, which Sherman believes is risky since the team could be left wanting for a big bat if other free sluggers have signed elsewhere once Cespedes makes his decision. In another MLB.com mailbag piece, Todd Zolecki “wouldn’t be surprised” if the Phillies part ways with Darin Ruf. Tommy Joseph has supplanted Ruf on the first base depth chart, and Zolecki writes that the Phils now see Ruf as “anything more than insurance” for Joseph or in left field. Ruf spent much of 2016 posting big numbers in Triple-A but hit just .205/.236/.337 in 89 PA for Philadelphia. Ruf’s next opportunity might not come in the big leagues, as Zolecki reports that Ruf has received interest from Japanese teams. With the Nationals expected to shift Anthony Rendon back to third base next year, the club will face a decision on fellow infielder Yunel Escobar, as Mark Zuckerman of CSN Washington writes. Escobar could shift to second, where he was expected to play this season, return to his natural shortstop, or even be dealt. The Nats’ roster could be tweaked in any number of ways over the winter, but deciding upon a strategy up the middle is a clear need. Phillies first baseman Darin Ruf has favorably impressed the organization with his play of late, CSNPhilly.com’s Jim Salisbury reports. Manager Pete Mackanin indicated that the club was glad to be getting a look at Ruf in more regular duty, which he’s received since Ryan Howard went down. “He’s swinging the bat very well,” said Mackanin. “We’re trying to get him at-bats so we can make a decision on him for next year. He’s swinging the bat better now against right-handers and he’s just been dominant against left-handers. It’s good to see.” Ruf’s situation obviously is interwoven with that of Howard. As Ryan Lawrence of the Philadelphia Daily News writes, Mackanin says that the veteran slugger needs to get his legs healthy and improve his glovework at first base to command playing time next year. Red Sox third baseman Pablo Sandoval is expected to miss the rest of the season with pneumonia, writes John Tomase of WEEI.com. This comes just a couple days after fellow offseason signee Hanley Ramirez was shut down for the year with a shoulder injury. Sandoval hit .245/.292/.366 on the year with 43 runs scored and 47 RBI. Ramirez managed just .249/.291/.426 with 59 runs and 53 RBI. Advanced metrics labelled both players as terrible defenders this season (Sandoval at least has a history of solid defense). Undoubtedly, the pair was expected to produce about twice as many runs with passable defense. Had they performed to those expectations, Boston’s 6.5 game deficit in the Wild Card race could be a lead. Boston has three potential candidates to man first base in 2016, writes Scott Lauber of the Boston Herald. The club plans to train Ramirez at the position after he failed to adjust to the outfield. Undoubtedly, Red Sox personnel hope first base can help Ramirez to stay healthy. The other internal option is Travis Shaw. He’s done enough to earn another look after hitting .282/.348/.511 with 11 home runs over 210 plate appearances. Shaw, 25, was never a highly touted prospect. The team may prefer to use him as depth. If they’re uncomfortable with Ramirez and Shaw, they could always dig into the coffers for Chris Davis. Personally, I expect any big free agent investments to be in the rotation. The Phillies have their own first base conundrum to solve, writes Jake Kaplan of the Philadelphia Inquirer. They anticipate an influx of talent next season, but first base will probably remain a time share between Ryan Howard and Darin Ruf. Howard will be in the final guaranteed season of a five-year, $125MM extension. Previous attempts to swap him to the junior circuit have turned up zero trading partners. Howard still hits well against right-handed pitchers while Ruf handles southpaws with aplomb. The platoon has combined for about -1 WAR this season, but they’ve also bashed a combined 33 home runs with 78 runs and 108 RBI in 766 plate appearances. That’s roughly a third of the team’s run production. Clearly, they can have some value to the club so long as they avoid same-handed pitchers. Nationals shortstop Ian Desmond is frustrated with his 2015 season, he tells Bill Ladson of MLB.com. Desmond, 30, is by far the top shortstop entering free agency, but he’s coming off his first below average offense campaign since 2011. Desmond hit just .232/.286/.382 on the year. When asked if he would accept a qualifying offer, Desmond hinted it was possible. The Phillies will recall outfielder Domonic Brown and option Darin Ruf following today’s game, the team announced (via Twitter). Brown was once Baseball America’s top prospect in baseball (ahead of Mike Trout no less). The 27-year-old has not lived up to expectations with a career .248/.308/.412 in 1,544 plate appearances. He missed the early portion of this season with left Achilles tendinitis. During his time in the minors, he hit .260/.315/.366 with slightly weaker numbers in 228 Triple-A plate appearances. The club would certainly like for the once toolsy prospect to feature some of the power, speed, and contact ability that was once expected of him. Ruf’s demotion is somewhat expected given a modest .238/.282/.386 slash in 110 plate appearances. The Phillies consider the righty to be a situational hitter. True to form, he’s mashed southpaws this year with a .400/.436/.629 line in 39 plate appearances. Given that he had options available, it’s reasonable for the club to temporarily move the 28-year-old to Triple-A. He’s liable to return to the majors if Ben Revere or Ryan Howard are traded.